I could experience almost everything of organic farming such as planting, mulching, weeding, harvesting, and etc. Furthermore, I could even help working at farmers market. I am thinking I want to manage organic farm and sell the vegetables by myself, so it great experience for me that I could help it. Also, to sell the vegetables which I picked by myself meant very much to me. There are some farmers markets in Japan but I have never been to it. However, I thought farmers market is quite good through participation it because we can buy or sell the vegetables or some foods face to face, and it contribute to reliability and safety. There are a lot of various vegetables which I could experience picking such as zucchini, rhubarb, leek, kale, carrot, beetroot, bean, asparagus, basil, herb, tomato, and lettuce, and some of them are that I have never done picking. Especially, basil and lettuce which I harvested were that I planted by myself. I thought it is the best part of farming and felt very glad when I finally harvested. Also, when I harvested the vegetables, I was careful to keep freshness and how to do beautifully to make them look more delicious. Appearance is very important to make the vegetables look delicious, so I paid close attention so as not to drop the quality of the vegetables by appearance. Of course, I couldn’t afford to work slowly by considering that the quality is important. It was sometime hard for me to work as fast as possible while trying to keep careful work, but I really enjoyed it. I mentioned above but it was severe to manage to keep the freshness of the vegetables as well as to make them beautiful. The very strong sunlight in Australia shriveled the vegetables as soon as I picked. I learned that the moist towel is good way to make shade and keep freshness. It is necessary to work fast from the viewpoint of freshness. As I thought, weeding cannot be avoided work in any organic farm. The optimum climate and soil for vegetables is an optimal environment for weed as well, and the growth of weeds is very fast. Therefore, the management of weeds was one of the most important works. I could experience mulching here but it was different method from I had knew. The only method I knew was by plastic or wood chip, but I could learn mulching by straw. Also, I again learned mulching is efficient method to manage weeds through WWOOF here because the beds between mulched and not were quite difference. It means that there were a significantly few weeds on the mulched beds. Also, the soil was quite soft by mulching, and I could feel the effect of mulching on water absorption and water retention. I was impressed by such a great effect of mulching. I have finished my WWOOFing for now with the activity here. 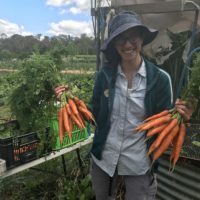 I could improve and learn a lot of things through WWOOF. 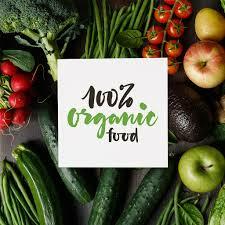 I will continue to study organic farming not to waste what I have gained, and I definitely want to have my farm in the future. 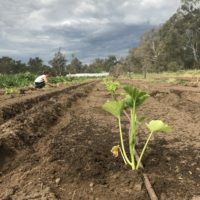 I would really love to come back Australia to do WWOOF someday. Thank you very much!